We're pleased to announce the availability of three new collections in our New England's Hidden Histories program. All of them contain some interesting history and insights into the lives of the people who created them. The church was gathered June 18, 1661. The congregation was established with representatives from the Churches of Christ from Dorchester, Roxbury, Springfield, and Hadley. Their first minister was Elezear Mather, followed by Solomon Stoddard. Stoddard's grandson, Jonathan Edwards, became their third minister, and served from 1727-1750. This volume contains articles of faith, a covenant, meeting minutes, admissions, dismissions, membership lists, baptisms, deaths, and marriages, and an index for members by name. The original book is owned by and housed at the Forbes Library in Northampton. We are grateful for their participation in this program. The Mount Wollaston Parish Meeting House was established in 1639 in the present-day Quincy Area, and by 1640 the town was renamed Braintree. Braintree originally included present-day Braintree, Quincy, Randolph, and Holbrook. The Parish Meeting House was the site of the original church, which first gathered on September 10, 1707. In 1708, old Braintree was divided into the North Precinct (Quincy) and the South Precinct (Braintree). When Quincy became an official town in 1792, the 1707 church was designated as the First Church in Braintree. 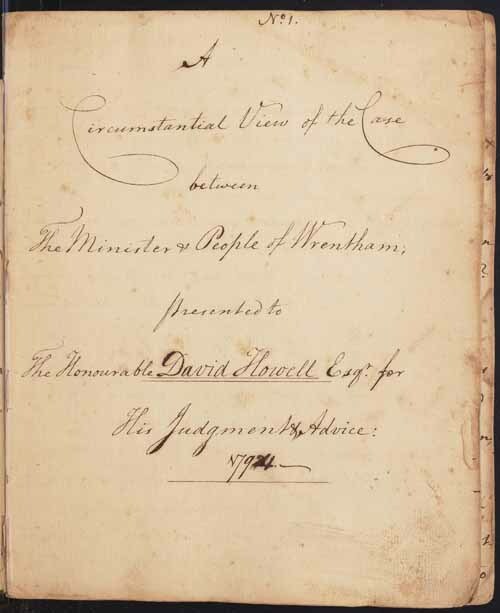 The records in this collection include the journal of Samuel Niles dating 1697 to 1777, a volume of the Braintree Precinct's Financial Records dating 1708 to 1796, and a volume of church records dating 1790 to 1825. Rev. David Avery (1746-1817) was born in Franklin, Connecticut. He graduated from Yale in 1769, studied theology at Dartmouth College, and was ordained as a missionary to the Native Americans in 1771. After serving as an army chaplain during the Revolutionary War, he was installed as the pastor in Bennington, Vermont in 1780. He moved to Wrentham, Massachusetts in 1783 to replace a minister who had died. The difficulties described in this volume grew, and he was dismissed from his service in Wrentham in 1794. This manuscript was prepared by Rev. David Avery and sent to David Howell, Esq. "for his judgment & advice" about the strife that had grown between Avery and his congregation.